Nine months have passed since the EU referendum. Now, we have an opportunity to review its impact on the UK housing market, and to consider the outlook for prices. The bottom line? Despite a slowdown that extended beyond the typical summer lag, the UK housing market has settled back into consistent growth rates in line with longer term trends. More recently, the Office for Budget Responsibility has predicted that the property market will outperform the rest of the economy in 2017. Although prices have slowed when compared to the rapid growth rates of the past three years, they are still rising steadily. Following the referendum result, the Land Registry House Price Index shows that values have been increasing month on month since November, returning towards the longer term growth trends. The ONS Private Rental Price Index indicates a brief slowdown in the summer months with an uptick in August – resulting in an overall annual rate of 2.2% from Jan ‘16–Jan ‘17. 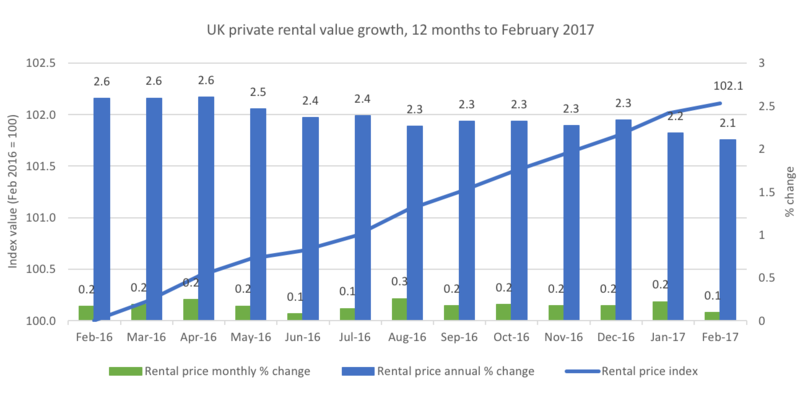 This is consistent with the long-term average from the last five years and reflects the stable nature of residential rents irrespective of wider market volatility. Nine months on from the referendum result, and both house prices and rents have stood up to economic uncertainty – seeing a return to growth following a period of stability. Once more, the housing market has proven its resilience, with the underlying value of bricks and mortar as a place of dwelling not subject to the volatile swings in market sentiment which afflict other asset classes such as stocks and shares. Often in times of uncertainty, people prefer to hold onto their homes, reducing stock and activity across the market. 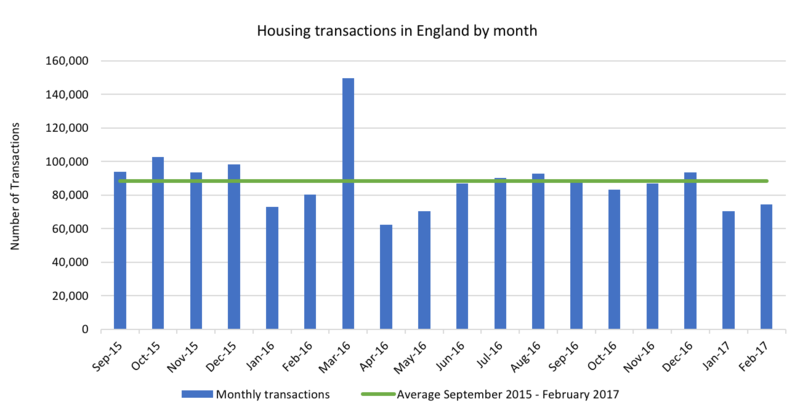 This trend can be identified again in the months following the referendum, and much has been made in the press about housing market activity slowing down recently. However, it’s important to look at this within the context of two aspects: (1) the total number transactions in the market and (2) housing supply relative to demand. Other than seasonal reductions typical of January and February, monthly transactions have remained consistent despite a markedly lower level of stock coming to market. In the last three years we’ve seen more than 1m total transactions per annum, well above the longer term average since the 2008 financial crisis. These transaction volumes appear despite the universally recognised supply shortage within the UK. According to the RICS Residential Sentiment Survey, the average number of properties listed by estate agents has dropped to 44, down from a long-term average of 70 three years ago. This consistency in transaction volume despite a lack of available stock demonstrates that the appetite from owner-occupiers and investors is still high. As a result, there is a sturdy bedrock for housing prices within the UK market, albeit at the expense of choice for buyers and a genuine shortage of housing in London and parts of the South East. Over the long term, UK residential property has outperformed all other major asset classes – and performance so far in 2017 supports the continuation of this trend. 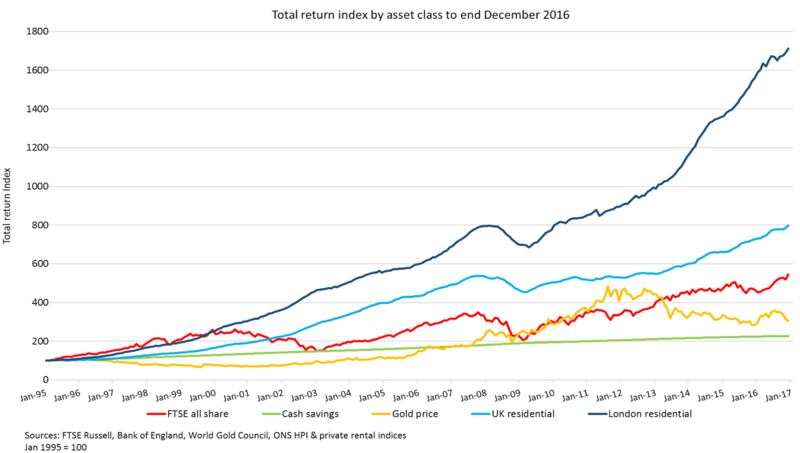 The annual rate of total returns on UK residential property is 10.4% over a twenty year period – beating cash savings (3.7%), gold price (5.8%), and FTSE all share (6.7%). This performance has also been more consistent, with very little price volatility compared to other assets. Since Brexit, residential property has not only demonstrated its resilience once again, but is also set to outperform the rest of the economy. Last month, the Office for Budget Responsibility forecasted that UK house prices will grow 26% over the next five years, compared to a 19% projection for economic growth and a continuation of low interest rates over the period. However, the fact remains that most investors are missing out on this asset class. Barriers to accessing direct buy-to-let investment have made it more difficult for independent, non-professional investors to access this viable asset class, which you can read more about here. The housing white paper: worth the wait?